Denny Hamlin finished second in Saturday’s NASCAR Sprint Cup Series race at Darlington (S.C.) Raceway, leading four times for 56 laps to take the checkered flag behind winner Jimmie Johnson. 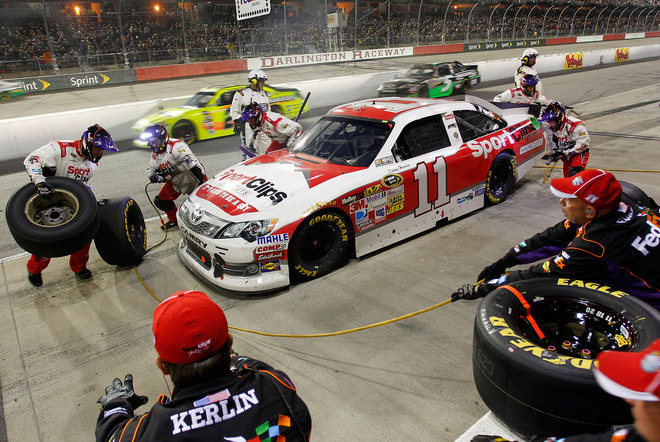 Hamlin — the 2010 Darlington winner — battled a tight car throughout the 367-lap event on the 1.333-mile egg-shaped oval, but a late call to stay out of the pits by crew chief Darian Grubb gave him the necessary track position to contend for the race win. A pair of late cautions set up a ‘green-white-checkered’ ending, where Hamlin was able to move up to second at the finish line.